Whether you're racking up miles as a business traveler or heading on vacation with the family, not much puts a damper on your trip like lost luggage. Thankfully, the newly announced Trackdot promises to keep track of your suitcase anywhere in the world. Just pair the diminutive device with any mobile phone, slip into your bag when packing, then check your bag with the confidence that it will be located via text or email as soon as you land. And though the accompanying app may save you a few extra minutes wrangling the crowds at the baggage carousel, it comes in extra handy when the airline messes up. No more waiting for the last suitcase to come down the chute to realize your luggage ended up on another flight. Now you can simply march to the counter and let them know what city to find it in. So how does this work in the current climate of FAA neuroses? The radio actually shuts down once the airplane hits 100mph and comes back on when the plane slows for landing. And because it uses AA batteries, you don't have to worry about recharging. 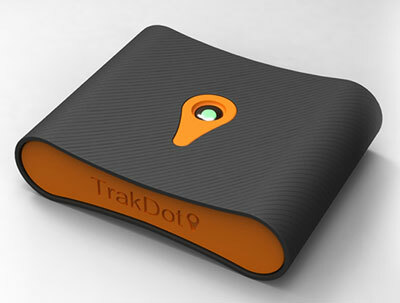 The Trackdot will be available in March for $49.95 with an activation fee of $8.99 and an annual fee of $12.99.